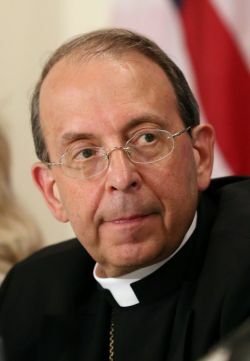 The following guest commentary on the recent report issued by the U.S. Commission on Civil Rights was written by Archbishop William E. Lori of Baltimore and provided to Catholic News Service. The archbishop is chairman of the U.S. bishops’ Ad Hoc Committee for Religious Liberty. On Oct. 7, I joined a diverse group of leaders, representing a broad spectrum of perspectives, in calling on President Barack Obama, Sen. Orrin Hatch and Speaker Paul Ryan to renounce the troubling claims put forth by the U.S. Commission on Civil Rights. The commission’s document, titled “Peaceful Coexistence,” recommends measures that purport to balance religious freedom and nondiscrimination laws. The choice of title would be humorous were the stakes not so high, for the proposed recommendations would achieve “peaceful coexistence” by simply steamrolling religious concerns. We are called to serve, particularly the poor. In St. Matthew’s Gospel, Jesus tells us that what we do to the least of these, we do to Jesus. St. James’s epistle famously says that faith without works is dead. When we think about exemplars of the Catholic faith, like Dorothy Day and St. Teresa of Kolkata, we admire them for their dedication to following Christ as servants. Faith moves us to action. As Pope Francis has said, when God’s love penetrates our hearts, it “brings forth in our lives and actions a primary and fundamental response: to desire, seek and protect the good of others.” Indeed, Pope Francis goes on, “no one can demand that religion should be relegated to the inner sanctum of personal life.” Faith is public. This commitment to action in service to others finds expression in robust networks of religious institutions, which in turn is also good for society as a whole. A recent study has found that “religion in the United States contributes $1.2 trillion each year to our economy and society.” The Catholic Church, for example, has built a large network of charities, hospitals, and schools, as we as Christians have sought to be faithful to Jesus Christ. These networks, and the networks of other faith communities, are vital for our country. The real target in the USCCR report is the traditional understanding of marriage and sexuality, which is (and will always be) held by the Catholic Church and so many others. But this teaching cannot be separated from the church’s other teachings. Catholic teaching forms a coherent whole. The same Scriptures, the same tradition of faith and reason, the same understanding of the human person — all of these elements weave together in harmony, serving both to animate and to delimit our work. Moreover, by suggesting that the government be free to force people of faith to violate their consciences, the USCCR report puts all our charitable works at risk. We cannot serve human dignity by undermining human dignity. And it is the poor and vulnerable — not the lawyers, professors, lobbyists and activists behind the USCCR report — who will suffer. The USCCR recommendations would essentially confer on the government the right to regulate how religious organizations define themselves, by controlling whom they hire and how they serve. Rather than respect long-revered principles of religious freedom and diversity, the USCCR would use the law to compel everyone to conform to its vision. All people of goodwill, both people of faith and people of no faith, should be disturbed by a proposal that says the government can force people to do things they believe are wrong, and that charities can be coerced into activities that undercut their mission. The USCCR represents an assault on civil society, and this assault affects all of us. This is not a serious proposal for life in a pluralistic society, and despite its venerable source, it should not be taken seriously.